To Mow at Home or Fly Fish along the Gunpowder River? The Gunpowder is gin clear and flowing at 101 CFs and has dropped to 52 F this week. Reports this week have featured lots of rising fish that have been easy to see and difficult to catch. Black flies in the #22-24 range have been best imitated by the poly wing pattern called a snow fly from the Little Lehigh. Mike Bachkosky just delivered 65 dozen or so Hendrickson emergers, dries–including some beautiful Catskill style wood duck flank winged patterns–and bright spot parachute spinners that now occupy the muffin tins. With the passing of the Spring Equinox just behind us, winter wind whipping through bare branches has been replaced by peepers singing in earnest. Rest assured that the whir of a weedeater and the din of a mower will soon drown out their chorus. For most, it’s time to knock the dust off of the gear and make some semblance out of tackle ditched in the late summer for other pursuits. This year the weather and the hatches likely won’t wait. Anglers are already speaking of Grannoms at Penn’s and Shad at the mouth of Deer Creek and Rockfish moving up into the Susquehanna flats. At the end of this post we have a few historical related posts that might be helpful in deciding how to answer that age old question; to mow or to fish? Spent a fantastic, warm Spring day out on the Gunpowder. Things seem to be really shaping up to be a good season. More and more fish seem to be rising and the hatches are really coming to life. The predominant hatch where I was today was the midge (darker shades) and the occasional little black stonefly. Naturally, the fish were keyed into the small stuff and preferred a good presentation: tiny black flies dropped with a black un-weighted zebra midge fished in shallow water did the job today. Really counting down the days to the big mayfly hatches! This entry was posted in fishing report on March 28, 2012 by Theaux Le Gardeur. Please join us for a fly fishing school. 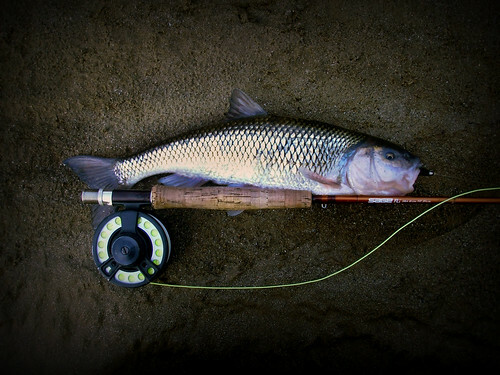 On Saturday, April 8, a Backwater Angler Guide will be teaching a fly fishing school that is ideal for beginners. If you’re planning on flyfishing Maryland, or anywhere else for that matter, this course is a great introduction to the sport. The school covers knots, casting, gear and fly selection. Class is held from 11:00 AM till 2:00 PM. Cost is $100 per person and includes the use of gear. A Maryland non-tidal fishing license and trout stamp is required and may be purchased at the shop with check or cash the day of the school. Class size is limited to 4 and pre-registration is required. Please give us a call at 410-357-9557 or drop us a line at info@backwaterangler.com to pre-register. This entry was posted in events on March 28, 2012 by Theaux Le Gardeur. Please join us for a fly fishing school. On Sunday, April 1, a Backwater Angler Guide will be teaching a fly fishing school that is ideal for beginners. If you’re planning on flyfishing Maryland, or anywhere else for that matter, this course is a great introduction to the sport. The school covers knots, casting, gear and fly selection. Class is held from 11:00 AM till 2:00 PM. Cost is $100 per person and includes the use of gear. A Maryland non-tidal fishing license and trout stamp is required and may be purchased at the shop with check or cash the day of the school. Class size is limited to 4 and pre-registration is required. Please give us a call at 410-357-9557 or drop us a line at info@backwaterangler.com to pre-register. This entry was posted in events, news on March 28, 2012 by Theaux Le Gardeur. 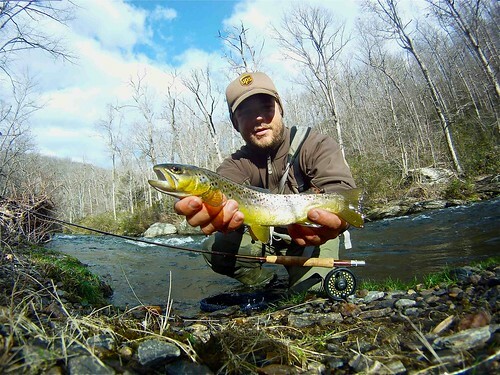 Gunpowder River FallFish, Stoneflies, Black Flies and Hendricksons! The Gunpowder river is flowing at 103 Cfs, clear and is 50F. Water temps along the catch and release section have jumped over six degress this week. Stoneflies are in full swing and black flies have been coming off above Falls in the gorge. Hendricksons have been coming off sporadically and everything is pointing to an early spring. Thanks to Stephen for the stream report and for joining Gunpowder RIVERKEEPER®! I know I should probably be emailing you on the other site, but I was the one in the store talking to you about GRK on Monday. You mentioned you could send me some information about the event on March 12th. I am joining the team and am excited about it. I will be putting the form and check in the mail tomorrow. I had a blast at Monkton Station after stopping by the shop on Monday. I only caught one trout, but I nailed some of the monster fallfish, ha. I caught one and was very impressed with the size. The second, out of the exact same spot, I had to take a picture, and the third, which I hope was a fallfish, was bigger yet. I didn’t really get a look at the third, but it was noticeably bigger and stronger. I was giggling at the size and fooling around a bit than I should have when the hook came loose. Of course the second I lost him I started wondering… Nah, it couldn’t have been a big brown. 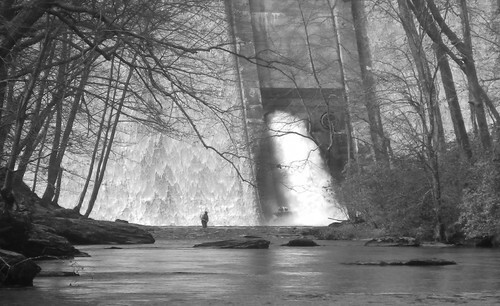 This entry was posted in fishing report on March 15, 2012 by Theaux Le Gardeur. 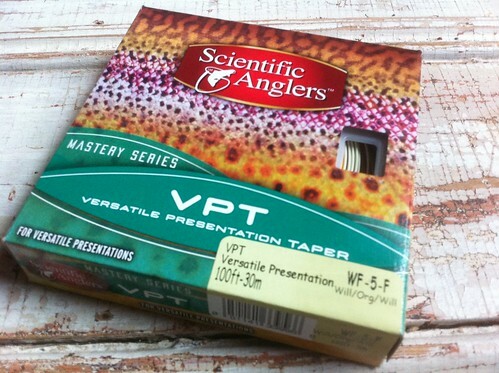 Thanks to John for the Review of the Sci Angler VPT Fly Line. Got in last night and figure I could write you up a quick note about the SA VPT line. First off the tri-colored line is actually pretty smart, pale off-white tip with the orange belly turning back into a pale running line makes sense to me as the view from underwater is pretty stealthy. Secondly unlike Rio there is only one loop, at the tip. I kinda like Rio and Cortland’s plan of making loop to loop connections from backing to fly line as it does run through guides smoother and makes changing line easier. Finally casting performance; it is easy to see in the first fifteen minutes of fishing that the team designing this line was obviously a bunch of dry fly addicts. I spent a good portion of my time cating 12-18′ leaders ending in 6 and 7X tippets with flies ranging from size 16 to 26. Turnover and castability were easy to get dialed back in with this line. 60-70 foot casts were accomplished which is further than most people would ever cast for trout, still good to know it is easily done. 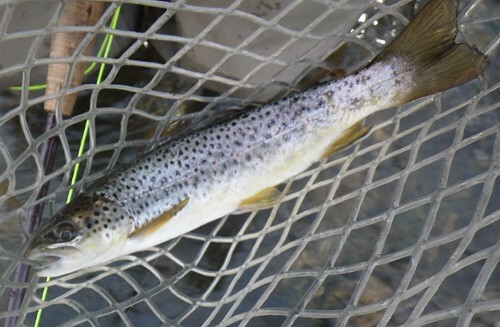 The wind beating power was not spectacular I must admit, but adequate for a line designed for all around trout fishing. When nymphing the line did have some trouble turning over indicators but nothing that a little casting compensation couldn’t overcome. All in all this line does exactly what it set out to do, I would actually rate it higher than the Rio Gold line for now. A few seasons down the road should tell who the real winner is, but SA has one here. Two Thumbs up. This entry was posted in gear, reviews on March 15, 2012 by Theaux Le Gardeur. The shop will be closed tomorrow, Monday, March 12 as a team of Gunpowder RIVERKEEPER® volunteers take part in Maryland Department of Natural Resources, (MDDNR) Stream Waders training. 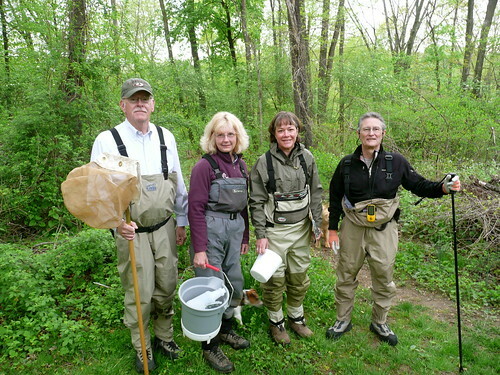 GRK volunteers are trained annually in scientifically defensible methods of collecting aquatic insects in tributaries within the sub-watersheds of the Gunpowder River. The Watershed covers parts of York County, Pennsylvania and Baltimore, Carroll and Harford Counties in Maryland. The macro-invertebrate samples are identified by MD DNR staff biologists and scored in a Benthic Index of Biotic Integrity, (BIBI). This information is used by the Maryland Department of the Environment, (MDE) to characterize stream health and identify potential impairments to biological communities. MDE uses BIBI as a component of state narrative water quality standards to uphold Clean Water Act classifications and mandates in the Gunpowder Watershed. This entry was posted in news on March 11, 2012 by Theaux Le Gardeur. Please join us for a fly fishing school. On Sunday, March 11, a Backwater Angler Guide will be teaching a fly fishing school that is ideal for beginners. If you’re planning on flyfishing Maryland, or anywhere else for that matter, this course is a great introduction to the sport. The school covers knots, casting, gear and fly selection. Class is held from 11:00 AM till 2:00 PM. Cost is $100 per person and includes the use of gear. A Maryland non-tidal fishing license and trout stamp is required and may be purchased at the shop with check or cash the day of the school. Class size is limited to 4 and pre-registration is required. Please give us a call at 410-357-9557 or drop us a line at info@backwaterangler.com to pre-register. This entry was posted in events on March 6, 2012 by Theaux Le Gardeur. The Gunpowder River jumped up this week to 266 CFs and is now dropping and flowing at 196 CFs. Expect levels to move up through the weekend as we get more rain. Water temps have been between 42 and 43.5 F owing to spillover. Fish are taking a mix of stoneflies and black flies on the surface. Streamer fishing has been more productive than nymphing for most. Look for fast riffles near jams. Fish are likely ambushing stonefly nymphs during the morning hours. Swinging double nymph rigs in the shallows near leaf litter to the banks should work fine. By mid-afternoon one can skate dries. We’re just a few weeks from Hendricksons so be sure to stop in for a new fishing license. It’s time to dust off your gear in anticipation of an early spring. Just to let you know I was out yesterday downstream of Masemore and certainly flow was up but still able to wade safely with a wading staff and being a bit discriminating. Streamers with cone heads were most successful in riffles. Tried a variety of approaches including nymphing with little success. Unfortunately, dydimo is much more evident than past weeks and may be being stripped off upstream rocks due to increased flow. Required frequent examination of leader and flies and cleaning. Did see an isolated BWO and what looked like black gnats. I saw several surface rises but no takers even to a BWO, black fly (gnat) combo.Wind was only occasionally an issue, with water temps where they are sun felt great. This entry was posted in fishing report on March 2, 2012 by Theaux Le Gardeur. Thanks for the advice Theaux! Not sure what I am gonna do yet but I do like the idea of Oak Orchard. Missing the crowds are almost as important to me as the fishing itself. I might just spend the time on the gunpowder though. Feel free to post any of the pictures I send you. I know I am always excited when I see new ones up on your website as I am sure other followers are! The nice little brown in the picture was caught just after Christmas. He was fooled by a little bead head nymph I tied while waiting for the tide to start rising in Bimini, Bahamas. 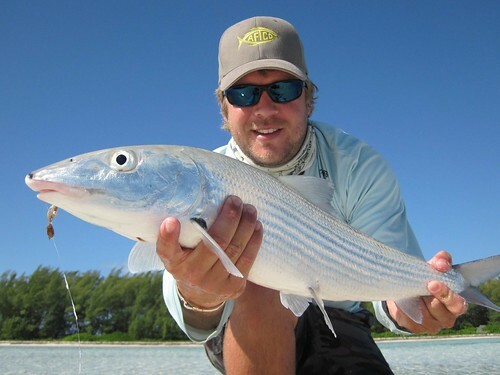 Although the fishing here for Bonefish has been amazing (see attached picture of a nice bone I caught off the east side of Bimini), I never can stop thinking about the Gunpowder. Even when the fishing is slow, I find myself enjoying all the other creatures that call its banks home. Accept for maybe the beavers on occasion. This entry was posted in news on March 2, 2012 by Theaux Le Gardeur.